For the Off-Broadway musical, see Giant (musical). Wealthy Texas rancher Jordan "Bick" Benedict Jr. travels to Maryland to buy a horse. There he meets and courts socialite Leslie Lynnton, who ends a budding relationship with British diplomat Sir David Karfrey and marries Bick after a whirlwind romance. They return to Texas to start their life together on the family ranch, Reata, where Bick's older sister Luz runs the household. Leslie meets Jett Rink, a local handyman, and he becomes infatuated with her. On a ride with Jett, Leslie discovers the local Mexican workers' living conditions are terrible. After tending to one of the Mexican children, Angel Obregon II, she presses Bick to take steps to improve their condition. When riding Leslie's beloved horse, War Winds, Luz expresses her hostility for Leslie by cruelly digging in her spurs. War Winds bucks her off, killing her. She leaves Jett a small piece of land on the Benedict ranch. Bick, who despises Jett, tries to buy back the land, but Jett refuses to sell. Jett makes the land his home and names it Little Reata. Over the next ten years, Leslie and Bick have twins, Jordan III ("Jordy") and Judy, and later have a daughter, Luz II. After discovering oil within a footprint left by Leslie, Jett begins digging and strikes oil on his land. He then drives to the Benedict house, covered in crude, to proclaim to the Benedicts that he will be richer than them. Jett makes a pass at Leslie, and this leads to a brief fistfight with Bick before he drives off. Jett's oil drilling company prospers over the years, and he tries to persuade Bick to let him drill for oil on Reata. Bick is determined to preserve his family legacy, however, and refuses. Meanwhile, tensions arise regarding the now-grown children. Bick insists that Jordy succeed him and run the ranch, but Jordy wants to become a doctor. Leslie wants Judy to attend finishing school in Switzerland, but Judy wants to study animal husbandry at Texas Tech. Both children succeed in pursuing their own vocations, each asking one parent to convince the other to let them have their way. At the family Christmas party, Bick tries to interest Judy's new husband, Bob Dace, in working on the ranch after he returns from the recently declared war, but Dace refuses. Jett arrives and persuades Bick to allow oil production on his land. Realizing that his children will not take over the ranch when he retires, Bick agrees. Luz II, now in her teens, starts flirting with Jett. Once oil production starts on the ranch, the Benedict family becomes even wealthier and more powerful. Meanwhile, the now-grown Angel is killed in the war, and his body is sent home for burial. The Benedict–Rink rivalry comes to a head when the Benedicts discover that Luz II and the much older Jett have been dating. At a huge party given by Jett in his own honor at his hotel in Austin, he orders his staff not to serve Jordy's Mexican wife, Juana. Enraged, Jordy tries to start a fight with Jett, who beats him and has him thrown out. Fed up, Bick challenges Jett to a fight. Drunk and almost incoherent, Jett leads the way to a wine storage room. Seeing that Jett is in no state to defend himself, Bick lowers his fists, and instead topples Jett's wine cellar shelves. The Benedict family leaves the party. Jett staggers into the banquet hall, takes his seat of honor, and passes out on the table. Later, Luz II sees Jett drunkenly bemoaning his unrequited love for Leslie. Luz II leaves, heartbroken, as Jett falls over onto the floor. The next day, on their way home, the Benedicts stop at a diner with a sign at the counter saying, "We reserve the right to refuse service to anyone," which during the mid-twentieth century in the southern United States was often taken as meaning that ethnic minorities were not welcome. The racist owner, Sarge, insults Juana and her and Jordy's son Jordan IV. When the owner goes on to eject a Mexican family from the diner, Bick tells Sarge to leave them alone. Bick fights Sarge, who beats him, but then takes down the sign and tosses it on top of Bick. Back at the ranch, Bick laments that he has failed to preserve the Benedict family legacy. Leslie replies that, after the fight in the diner, he was her hero for the first time, and that she considers their own family legacy a success. They look at their two grandchildren, one white and one Hispanic. Rock Hudson as Jordan "Bick" Benedict Jr.
Nick Adams recorded some of James Dean's dialogue after Dean's death. Ferber's character of Jordan Benedict II and her description of the Reata Ranch were based on Robert "Bob" J. Kleberg Jr. (1896–1974) and the King Ranch in Kingsville, Texas. Like the over half-million-acre Reata, King Ranch comprises 825,000 acres (3,340 km2; 1,289 sq mi) and includes portions of six Texas counties, including most of Kleberg County and much of Kenedy County, and was largely a livestock ranch before the discovery of oil. The fictional character Jett Rink was inspired partly by the extraordinary rags-to-riches life story of the wildcatter oil tycoon Glenn Herbert McCarthy (1907–1988). Author Edna Ferber met McCarthy when she was a guest at his Houston, Texas, Shamrock Hotel (known as the Shamrock Hilton after 1955), the fictional Emperador Hotel in both the book and the film. The Australian actor Rod Taylor was cast in one of his earliest Hollywood roles after being seen in an episode of Studio 57, "The Black Sheep's Daughter". Stevens gave Hudson a choice between Elizabeth Taylor and Grace Kelly to play his leading lady, Leslie. Hudson chose Taylor. After James Dean's death late in production, Nick Adams overdubbed some of Dean's lines, which were nearly inaudible, as Rink's voice. George Stevens had a reputation as a meticulous film editor, and the film spent an entire year in the editing room. The film begins with Jordan "Bick" Benedict, played by Hudson, arriving at Ardmore, Maryland, to purchase a stallion from the Lynnton family. The first part of the picture was actually shot in Albemarle County, Virginia, and used the Keswick, Virginia, railroad station as the Ardmore railway depot. 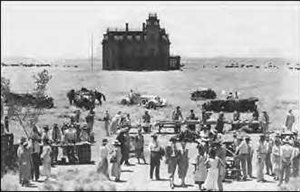 Much of the subsequent film, depicting "Reata", the Benedict ranch, was shot in and around the town of Marfa, Texas, and the remote, dry plains found nearby, with interiors filmed at the Warner Brothers studios in Burbank, California. The "Jett Rink Day" parade and airport festivities were filmed at the Burbank Airport. During the restaurant fight scene at the film's end, the jukebox plays The Yellow Rose of Texas by Mitch Miller. That version of the song happened to be the #1 pop single on the Billboard Magazine Best Sellers chart at the time of James Dean's death. The movie is an epic portrayal of a powerful Texas ranching family challenged by changing times and the coming of big oil. A major subplot concerns the racism of many Anglo-European Americans in Texas during the mid twentieth century and the discriminatory social segregation enforced against Mexican Americans. In the first third of the film, Bick and Luz treat the Mexicans who work on their ranch condescendingly, which upsets the more socially-conscious Leslie. Bick eventually comes to realize his moral shortcomings – in a climactic scene at a roadside diner he loses a fistfight to the racist owner, but earns Leslie's respect for defending the human rights of his brown-skinned daughter-in-law and grandson. Another subplot involves Leslie's own striving for women's equal rights as she defies the patriarchal social order, asserting herself and expressing her own opinions when the men talk. She protests being expected to suppress her beliefs in deference to Bick's; this conflict leads to their temporary separation. Giant is Edna Ferber's third novel dealing with racism; the first was Show Boat (1926), which was adapted into the legendary Broadway musical Show Boat (1927); her second was Cimarron (1929), which was adapted to film twice, in 1931 and 1960. Giant premiered in New York City on October 10, 1956, with the local DuMont station, WABD, televising the arrival of cast and crew, as well as other celebrities and studio chief Jack L. Warner. The picture was released to nationwide distribution on November 24, 1956. Capitol Records, which had issued some of Dimitri Tiomkin's music from the soundtrack (with the composer conducting the Warner Brothers studio orchestra) on an LP, later digitally remastered the tracks and issued them on CD, including two tracks conducted by Ray Heindorf. Both versions used a monaural blend of the multi-channel soundtrack recording. Giant won praise from both critics and the public, and according to the Texan author, Larry McMurtry, was especially popular with Texans, even though it was sharply critical of Texan society. Bosley Crowther of the New York Times wrote that "George Stevens takes three hours and seventeen minutes to put his story across. That's a heap of time to go on about Texas, but Mr. Stevens has made a heap of film." He continued to write that "Giant, for all its complexity, is a strong contender for the year's top-film award." Variety's "Hift" claimed that Giant was "for the most part, an excellent film which registers strongly on all levels, whether it's in its breathtaking panoramic shots of the dusty Texas plains; the personal, dramatic impact of the story itself, or the resounding message it has to impart." In the 21st century, TV Guide gave the film four stars out of five, saying of James Dean's performance "This was the last role in Dean's all-too-brief career – he was dead when the film was released – and his presence ran away with the film. He performs his role in the overwrought method manner of the era, and the rest of the cast seems to be split between awe of his talent and disgust over his indulgence." The film received a 95% approval rating on the review aggregator site Rotten Tomatoes, based on 39 reviews, with an average rating of 7.6/10. The movie earned $12 million in rentals in North America during its initial release. It was one of the biggest hits of the year in France, with admissions of 3,723,209. 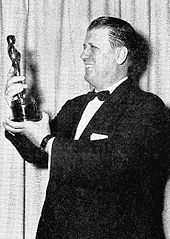 Giant won the Academy Award for Best Director and was nominated nine other times, twice for Best Actor in a Leading Role (James Dean and Rock Hudson). The other nominations came in the categories of Best Actress in a Supporting Role (Mercedes McCambridge); Best Art Direction–Set Decoration, Color (Boris Leven, Ralph S. Hurst); Best Costume Design, Color; Best Film Editing; Best Music, Scoring of a Dramatic or Comedy Picture; Best Picture; and Best Writing, Best Screenplay – Adapted. ^ a b Miller, Frank. ". :: TCM Presents: The Essentials - Article::". Turner Classic Movies. Archived from the original on January 13, 2015. Retrieved January 13, 2015. ^ Jonathan Yardley (May 8, 2006). "Ferber's 'Giant,' Cut Down to Size". Washington Post. The Washington Post Company. Archived from the original on March 3, 2016. Retrieved 3 March 2016. ^ Julie Goldsmith Gilbert (1999). Ferber: Edna Ferber and Her Circle, a Biography. Hal Leonard Corporation. pp. 147–148. ISBN 978-1-55783-332-7. ^ L.C. Information Bulletin. Library of Congress. 2006. p. 43. ^ "Giant: Summary and Notes". Catalog of Feature Films. American Film Institute. Retrieved 20 August 2012. According to modern and contemporary sources, Grace Kelly was sought for the role of Leslie Benedict. Modern sources claim that once her engagement to Prince Rainier of Monaco was announced, however, M-G-M decided not to loan her out for Giant. Elizabeth Taylor, who ultimately received the highly desirable role, was also under to M-G-M, which loaned her out to Warner Bros. Modern sources also claim that Hudson, when given the choice of his leading lady by Stevens, chose Taylor. ^ Maurer, David. "Giant effort to make it in movies". Daily Progress. Archived from the original on 21 January 2013. Retrieved 20 August 2012. ^ Marilyn Ann Moss (4 August 2015). Giant: George Stevens, a Life on Film. Terrace Books, University of Wisconsin Press. p. 217. ISBN 978-0-299-20433-4. ^ a b McMurtry, Larry (September 29, 1996). "Men Swaggered, Women Warred, Oil Flowed". New York Times. Retrieved 21 August 2012. ^ Lee Stacy (1 October 2002). Mexico and the United States during that time in history. Marshall Cavendish. p. 326. ISBN 978-0-7614-7402-9. ^ "Giant: Summary and Notes". Catalog of Feature Films. American Film Institute. Retrieved 20 August 2012. ^ Eliza McGraw (7 January 2014). Edna Ferber's America. LSU Press. p. 50. ISBN 978-0-8071-5189-1. ^ a b Perry, George (2011). James Dean (paperback ed.). Bath, 1956. U.K.: Palazzo. pp. 227, 233. ISBN 978-095-649-427-6. ^ Crowther, Bosley (October 11, 1956). 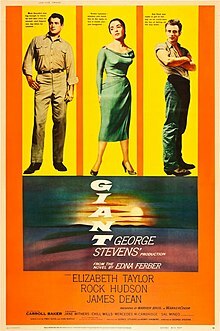 "Movie Review: Giant (1956). Screen: Large Subject; The Cast". The New York Times. ^ "Hift" (October 10, 1956). "Giant (Review)". Variety. ^ "Giant (1956)". TV Guide. Retrieved May 3, 2010. ^ "Giant (1956)". Rotten Tomatoes. Fandango Media. Retrieved March 21, 2018. ^ Soyer, Renaud (November 9, 2014). "Box Office France 1957". Box Office Story. Retrieved March 21, 2018. ^ "Giant (1956): Awards". All Media Guide via The New York Times. Retrieved August 1, 2012. Wikimedia Commons has media related to Giant (film).